I recently finished using a small Allan’s Journal as a daily journal. In the end I decided not to buy another one to replace it, but that wasn’t because it was bad, just simply a few aspects of it weren’t quite what I was after. The Allan’s Journal looks rather like a Bible in construction, as you can see from the pictures, with a tough, flexible, leather cover, a ribbon, red under gold edges to the very thin pages, and even what it is embossed on the cover. (Fewer pages, but still a lot for a notebook.) They are in fact made by an old Scottish company that usually specialises in making Bibles. When considering an order, I theorised that there are certain characteristics of a portable Bible or other religious text that are desirable for a notebook – they need to be tough, long-lasting, compact, easy to carry and be able to store a lot of information – so I was interested to see how well this theory held up. First of all, this journal costs £22. You should be aware of this at the start. However, given that it lasted me for slightly over three months, and I write a lot in my journals, this works out to be pretty good value as far as I’m concerned. Worldwide delivery is free, too. The larger, A5-ish version costs £25, and that would last for even longer. According to the website, several colour and size combinations are out of stock as of time of writing, and are due to be reprinted in late 2011. The pocket Allan’s is around the same height and thickness as most A6-ish pocket notebooks, but noticeably wider. You can get it into a large pocket, but not a small one. In practice I only occasionally pocketed it, mostly keeping it in my bag, but it’s fine for jackets and combat trousers. It has 256 pages, because the paper is so thin – see below regarding the paper. The (real) leather cover is flexible, though not floppy, and thick enough to be tough. You’d have to be very unlucky to damage it beyond a scratch or two. It is “semi yapp”, which means that the edges of the cover extend a little way beyond the edges of the pages, to protect them on the sides as well as the faces. I never experienced the slightest hint of it coming apart. I found the binding very secure as well, but the book also opens and lies very flat, without needing any force at all. Opening flat (or not doing so) is one thing that always annoys me about notebooks; I found that the Allan’s was the best I’ve seen so far. 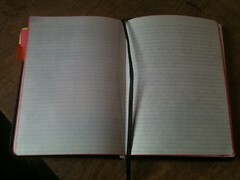 There are two things you would immediately notice on opening an Allan’s journal – how thin the paper is, and how narrow the lines are. It’s almost airmail/onionskin paper thickness, and the paper has a light 4mm rule, the thinnest I’ve yet seen. What you would not immediately notice was how amazingly good this paper is. It isn’t shiny and impermeable as you might suppose – it has a normal level of absorbency, and inks dry quickly on it and look pleasant. On the other hand there was no bleeding or feathering from any fountain pen or normal ink that I tried, from fine to broad. (Sharpies do bleed through the paper, but that’s not unexpected.) Despite this the paper is tough and won’t easily tear. It is absolutely the best thin paper I have yet come across, even including the Midori Traveller’s Notebook ultra-thin paper that I’ve mentioned before, which is not by any means bad, just a bit shinier and easier to smear on. Due simply to how physically thin the pages are, you can sometimes see writing through from the other side, but because the ink isn’t bleeding through this isn’t a problem – I rarely even noticed it. On the other hand, the 4mm ruling did get on my nerves on occasion. When I was in the mood to write with a fine nib it was, well, fine. It’s very difficult to write tidily with a medium or larger nib with that ruling, though, and I like to do that at times. This sounds great – why aren’t you getting another one? This was a useful purchase because it has convinced me that I really don’t like pocket journals any more. It’s basically the perfect pocket journal, apart from the height of the lines and maybe that it’s not hardbacked, but I could get used to both of that. Given that, after using the Allan’s for three months, I was still thinking “yes this is great but I wish the pages were larger, I can’t fit all my thoughts in”, I can safely be sure now that I should not be using pocket notebooks as my main journals, and that I should stick to A5-ish for my journal and Rhodia pads and little pocket cahiers in my pockets, for small notes and ideas and shopping and to-do lists or whatever, not to record the happenings of the world for posterity. you should definitely have a think about getting an Allan’s journal. For the moment I have moved onto an A5 Leuchtturm notebook, but I look forward to trying out the larger Allan’s that I bought at some later date. Thank you so much for your attention to detail in your notebook reviews. Not that I think you are a walking notebook advertisement, but have you any product suggestions for someone who prioritizes thin pages and would like to spend less than the $40 Allan’s Journal costs? 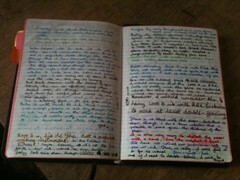 I write in pen (ballpoint, but the ink is liquid and flows lovely with little pressure) and prefer unlined pages. 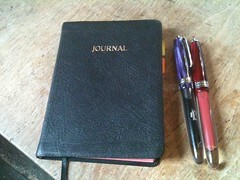 the Travelers Notebook thin paper refill, which I think I’ve written about on this blog already. The issue there is of course that you have to get a Travelers Notebook as well. But the paper is excellent and very thin. With a ballpoint your options do open up a it it – for instance, you can look at Moleskines, which have quite thin paper and are well constructed even if they don’t like fountain pens much.